With Vaporum on the PS4, the genre makes the leap to an atmospheric steampunk setting. That alone makes it stand out from the rest, but does it do enough to bring new fans into this type of gameplay, or should this tower remain abandoned? Let’s find out. I’ve always enjoyed grid-based dungeon crawlers, but they often lack enough of a narrative to keep me going throughout. They also tend to be frustratingly difficult. Vaporum addresses both of these issues by offering an intriguing story and plenty of difficulties to choose from for any skill level. The story itself starts with a protagonist who finds themselves outside of an ominous metal tower far from civilization. With no memory of how they got there, they decide to enter based on a sense that they’ve been to this place before. From here, Vaporum deals out its story through narration, audio logs, and written documents you find as you explore the labyrinth floors of the Arx Vaporum tower. The writing is engaging enough to be believable, and subtle name drops add more vocabulary to the world and the lore. While the tower is seemingly abandoned, you do get the feeling that it was once a bustling center for research and technology. I particularly liked finding entries about enemies, only to face them in person and put a face to the name. Now, I love this kind of worldbuilding, but some people just want to get into the action. Vaporum totes this line well, offering plenty of optional story elements but never forcing them upon you. While it may seem simple, moving from space-to-space and attacking enemies accordingly, the reality is that this type of dungeon crawler requires intense strategy and planning to avoid being ripped apart by stronger enemies. Thankfully, lower difficulties do allow for plenty of error without an immediate game over. 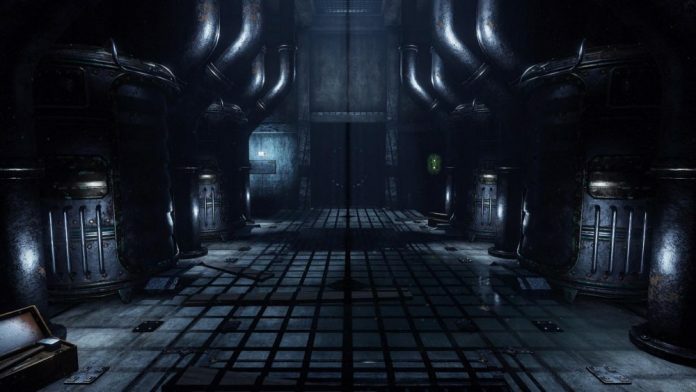 That being said, The Arx Vaporum is home to plenty of puzzles and traps that will indeed end your journey prematurely. It’s possible to save at any time, however, and I recommend doing so often as I found myself on the wrong side of a spike pit more times than I could count. Combat and RPG mechanics are all in fine form here, with the ability to switch between two loadouts by clicking the right stick during combat. This was nice for jumping between close and long ranged weapons. You also come across abilities you can equip, such as a shock or fire attack. Furthermore, you get to choose a type of suit early on that lets you tweak your approach and refine it further through skill trees that focus on specific stats or skills. The only part where Vaporum started to crack for me were the puzzles. Even with continuous movement enabled, Vaporum holds strict to the grid-based movement for better or worse. This is fine in combat, but many of the puzzles require you to hit multiple switches and then sprint to a location before the timer runs out. It’s very hard to achieve precision when you’re moving one space at a time. In most cases, I ended up facing one direction and furiously strafing around the environment after I had memorized the path from the button to the door. It works, but it’s far from ideal. These moments were often a source of frustration and hurt the pacing as they offered more challenge than the combat (for all the wrong reasons). One other issue I ran into involved a save error on my PS4 that only triggered when I booted up Vaporum. I noticed that another review mentioned the same problem. While it was fixed by rebuilding the system database, I found it odd that this game seemed to trigger the issue. While it’s clear it’s a problem on the PS4 side, it just seemed weird that someone else experienced the same problem when playing. I can’t say for sure that the game had anything to do with the sudden error, but again, a database rebuild did the trick for me, so it could have been unrelated in both instances. Between the unique setting and the largely compelling gameplay, Vaporum indeed makes a strong case for the genre to those who want to try a different flavor of dungeon crawling. Vaporum succeeds in its presentation through its use of detail and superb atmosphere. The game’s environments have a tinge of darkness and decay that combines with smart uses of lighting and clever camera movements. For example, when you stand still, the camera will move around slightly, giving off the impression that the main character is examining his environment. It adds another layer of depth to the world and makes it feel like more than just spaces on a grid. Impressive graphical effects during combat also add a weight to your attacks that many titles in this genre lack. It does have some small issues, like frame rate hitches whenever you kill and enemy, but they never caused me to lose a battle or fail a puzzle. While I would have liked less time-based puzzles and sharper controls, I can’t deny that Vaporum really pulled me into its world and found its way into my mind to the point where I wanted to come back and see where it all leads. 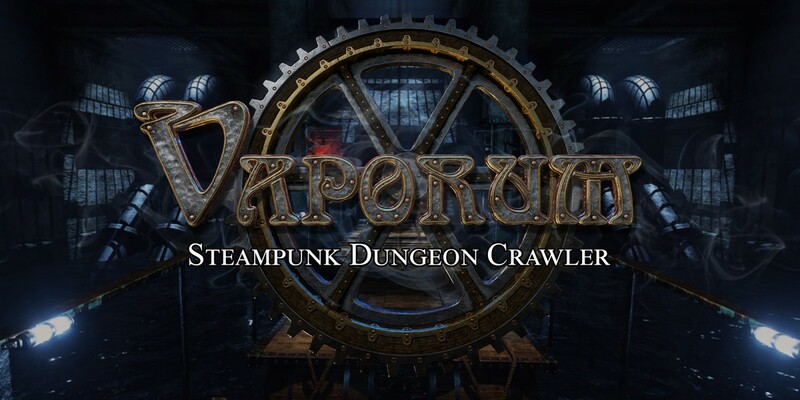 There aren’t enough steampunk titles in gaming, and when you combine that with a solid grid-based dungeon crawler, Vaporum becomes a rare gem in gaming that even newcomers to the genre will appreciate.